You deployed your application or function to Knative Serving but its performance doesn’t meet your expectations. Knative Serving provides various dashboards and tools to help investigate such issues. This document reviews these dashboards and tools. Start your investigation with the “Revision - HTTP Requests” dashboard. 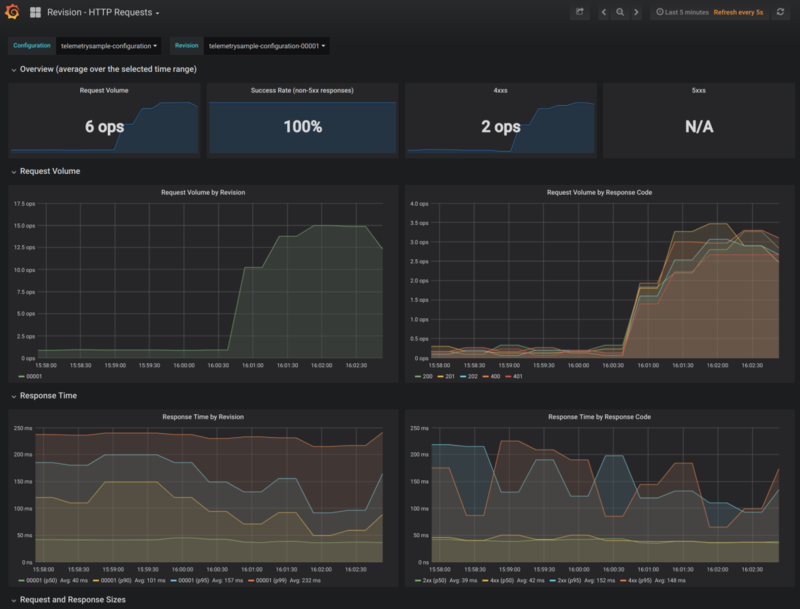 To open this dashboard, open the Grafana UI as described in Accessing Metrics and navigate to “Knative Serving - Revision HTTP Requests”. This dashboard can show traffic volume or latency discrepancies between different revisions. If, for example, a revision’s latency is higher than others revisions, then focus your investigation on the offending revision through the rest of this guide. 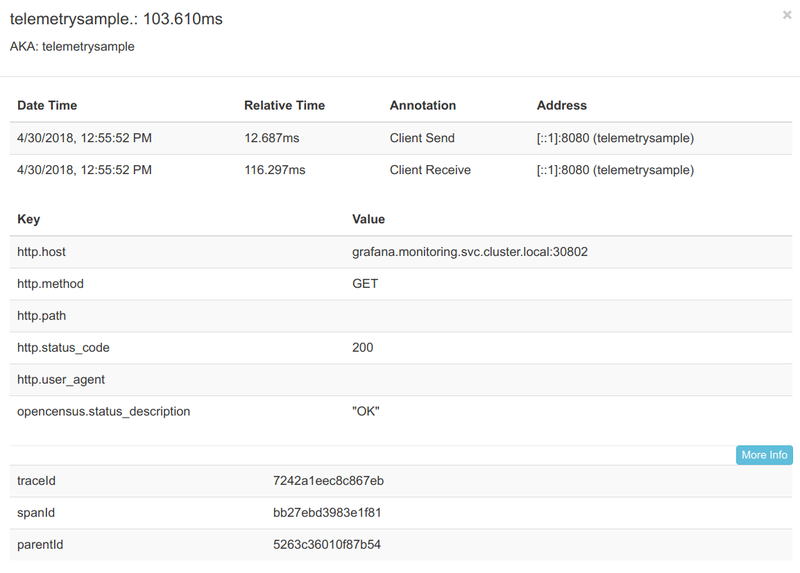 Next, look into request traces to find out where the time is spent for a single request. To access request traces, open the Zipkin UI as described in Accessing Traces. In this example, you can see that the request spent most of its time in the span right before the last, so focus your investigation on that specific span. This view shows detailed information about the specific span, such as the micro service or external URL that was called. In this example, the call to a Grafana URL is taking the most time. Focus your investigation on why that URL is taking that long. If request metrics or traces do not show any obvious hot spots, or if they show that most of the time is spent in your own code, look at autoscaler metrics next. Panic mode: If 0, the autoscaler is operating in stable mode. If 1, the autoscaler is operating in panic mode. A large gap between the actual pod count and the requested pod count indicates that the Kubernetes cluster is unable to keep up allocating new resources fast enough, or that the Kubernetes cluster is out of requested resources. A large gap between the requested pod count and the desired pod count indicates that the Knative Serving autoscaler is unable to communicate with the Kubernetes master to make the request. In the preceding example, the autoscaler requested 18 pods to optimally serve the traffic but was only granted 8 pods because the cluster is out of resources. The first chart shows rate of the CPU usage across all pods serving the revision. The second chart shows total memory consumed across all pods serving the revision. Both of these metrics are further divided into per container usage. user-container: This container runs the user code (application, function, or container). istio-proxy: Sidecar container to form an Istio mesh. queue-proxy: Knative Serving owned sidecar container to enforce request concurrency limits. 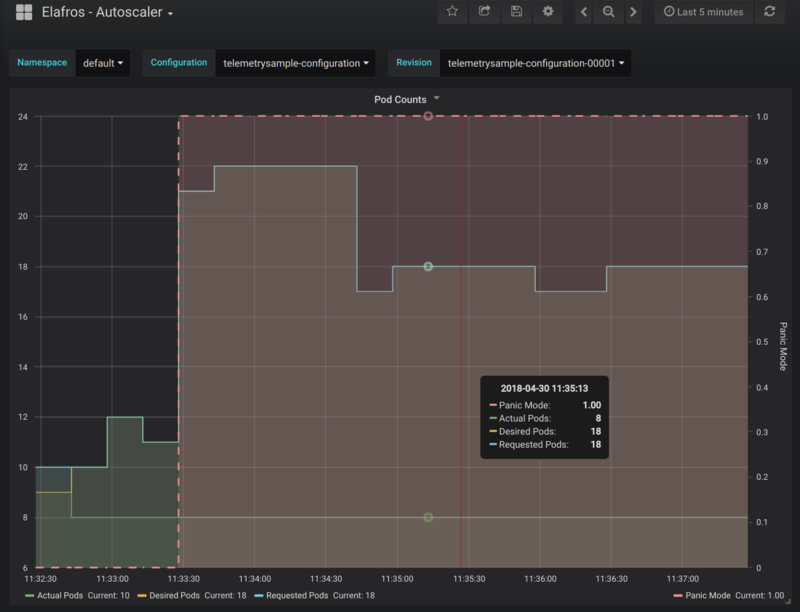 autoscaler: Knative Serving owned sidecar container to provide autoscaling for the revision. fluentd-proxy: Sidecar container to collect logs from /var/log.